Building small-scale and miniature furniture is as challenging and rewarding as full-scale furniture building but only costs a fraction of the time, space and money. Miniature Adirondack chairs are fairly simple to construct, and their distinctive design makes them useful in creative and playful ways. Miniature modelers can transform the pint-size chairs into crafts that serve decorative or functional purposes. Outdoor furniture and accessory miniatures for dollhouses can be difficult to find. Mini Adirondack chairs help complete the house’s facade when used on patios or terraces. Glue a few miniature accessories like towels, a picnic basket or cocktails onto the chair seat, back or arm rests for a cute addition to a pool or backyard scene. Mini Adirondack chairs for dollhouses also liven up the interior space. Paint a few chairs in bright, bold color or a simple pattern and incorporate in a sun room, hallway or office space for a Bohemian or country look. Embellish chairs with carved shapes, fabric or fine metallic paintwork for incorporation in a more formal or refined dollhouse room. 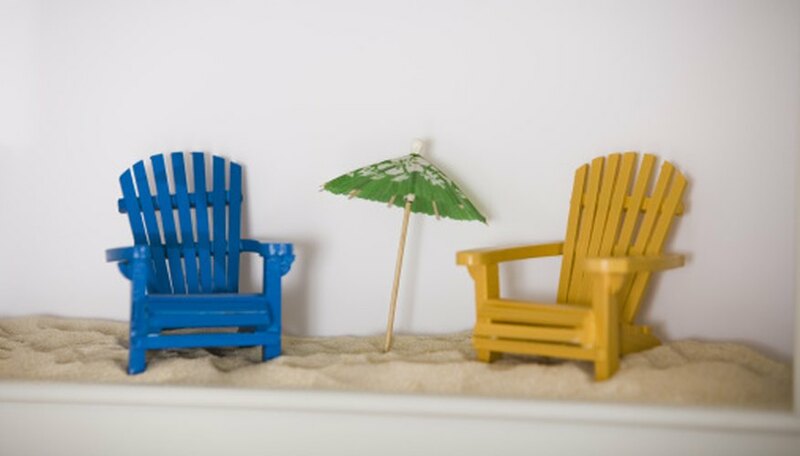 Miniature Adirondack chairs make playful tabletop decorations for parties and events. These tiny crafts also make festive cake toppers, favors and gifts. Build several chairs following a simple design to use as as table decor alongside margarita glasses and tropical flowers, adding ambiance to a beach- or luau-themed event. For a slightly more challenging project, construct miniature chairs to hold a place card, photo or envelope. Choose heavier wood and other construction materials to make a whimsical paperweight or ornament.